It’s easy to get the idea that we Americans rule the food mash-up world with our Cronuts, Funnel Cake Ice Cream Sandwiches and Animal-Style Pizzas. But down in Australia, Sydney’s Belly Bao has a strong entrant into the crowded hybrid food market. 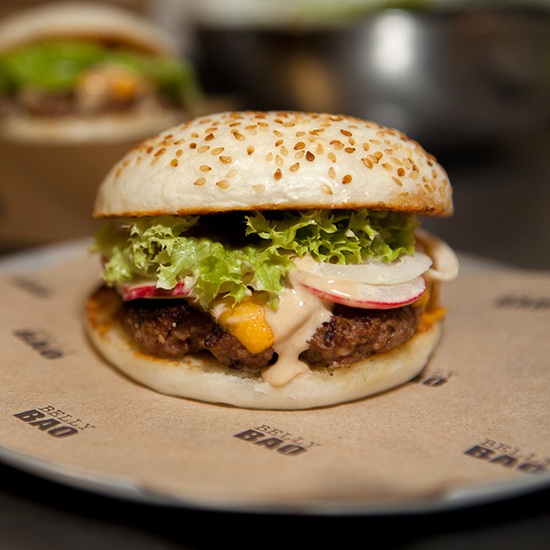 Just in time for burger month, which kicks off today, we present to you the Baoger. Chef Sylvia Tran started selling her gua bao, traditional Taiwanese steamed buns, in Sydney market stalls a little more than a year ago. Now she’s found a permanent home in the Goodgod nightclub, where she has the space to do some bao experiments like this one. The bread: An extra-large, pillow-soft, perfectly chewy steamed gua bao, flecked with sesame seeds and shaped to look like a hamburger bun. The filling: Tran starts with the traditional beef patty topped with melted American cheese. Then she adds pickled radishes, onions and romaine for crunch and finishes with a sweet, spicy sauce. Currently, Belly Bao only sells baogers on Thursdays, but this seems like too good an idea to remain restricted to a single day.